Japan imported China’s Yin-Yang divination and Feng Shui practices in the mid-6th century CE, including astrological lore surrounding star groupings such as the Seven Big Dipper Stars, the Nine Luminaries, the 12 Zodiac Signs, the 28 moon lodges, and the 36 animals. The most receptive camps were Japan’s esoteric Shingon and Tendai schools, which took the lead in introducing star worship to Japan. The integration of celestial bodies into Japanese Buddhism peaked during the mid-and-late Heian period, but star faith never developed into a major branch of Japanese esoteric art — indeed, the number of extant star mandala and star-related masterpieces in Japan is very limited. 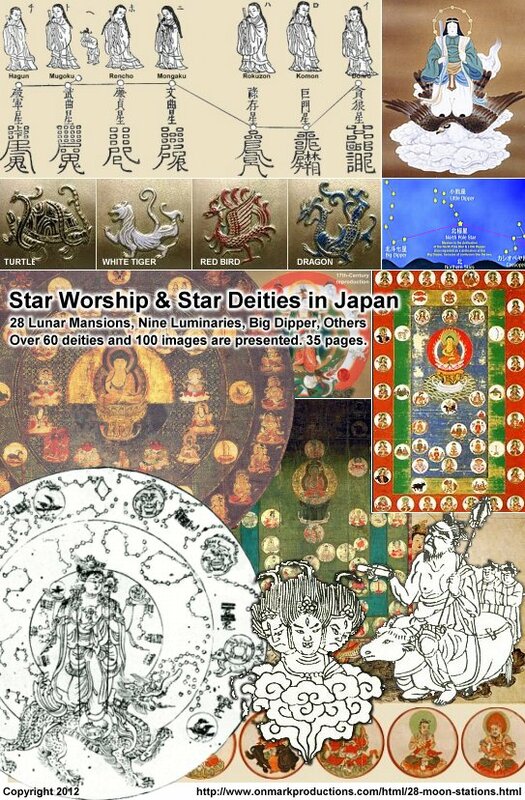 Star worship is still alive today in Japan, but it is not a major force in modern religious practice. This 35-page report presents a brief history of the 28 moon lodges in China and the group’s later usage in Japanese star worship. This is followed by a lengthy review of the 28, plus a guide to the deification of other important stars and planets, including the Seven Big Dipper Stars, the Nine Luminaries, and the Pole Star (aka Myōken Bosatsu). All together, some 60 deities and over 100 images are presented. Click the image below to get started. Enjoy the tour. Popcorn not included. Explores over 60 deities. Features over 100 photos. In Japan today, many temples and shrines have “commercialized” religious cosmology based on Chinese astrological concepts. In Japan the system is called Yakudoshi 厄年, which translates directly as “bad luck years.” It is based on the concept of Chinichi 直日 — a specific day on which a heavenly body (or bodies) exert an undue influence on earthly affairs. To determine if one’s fortune will be good or bad requires a knowledge of the movement of the celestial bodies, including those of the Big Dipper, the Nine Luminaries (five planets, sun, moon, comets, eclipses), the Twelve Signs of the Zodiac, and the Twenty-Eight Moon Lodges (this page). For Japanese men, the most inauspicious ages are 25, 42, and 61. For women, the ages are 19, 33, and 61. This is an oversimplification, mind you. During these unlucky years (and others), people are urged to visit temples and shrines and pay money for rites that will provide divine protection from baleful celestial influences. For reasons unknown to me, the worst years are 42 for men and 32 for women. 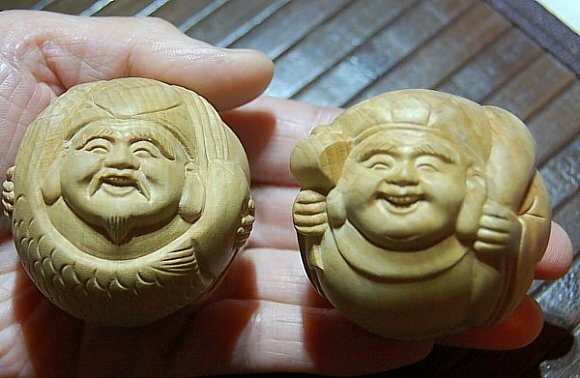 Many of Japan’s temples & shrines aggressively market such beliefs to increase revenues. 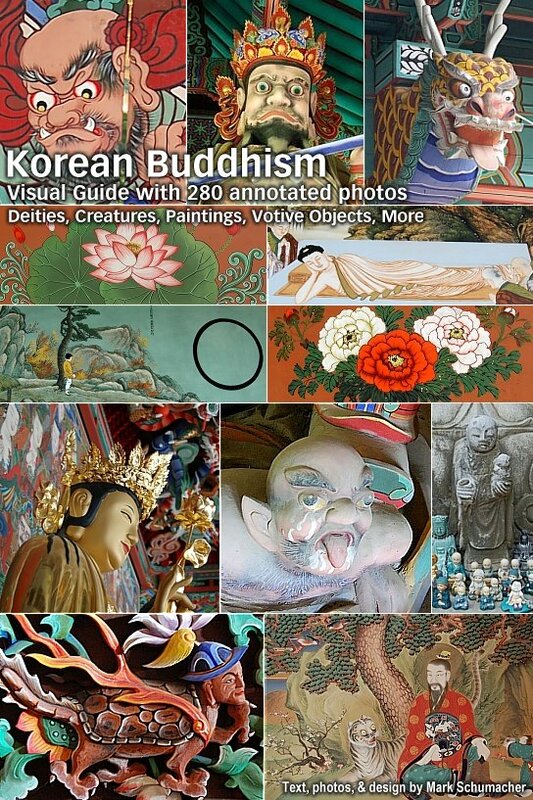 Over 280 annotated photos exploring the creatures, deities, and artwork of Korean Buddhism. These photos were taken in June-July 2012 by site author Mark Schumacher, who journeyed to Korea to explore Kanhwa Sŏn 看話禪 and Hwadu 話頭 meditative techniques (the Korean counterpart of Japanese Zen kōan meditation). This special report includes an overview of Kanhwa Sŏn practice and features a sidepage entitled Korean Influence on Early Japanese Buddhism. Click the image below to get started. Enjoy the tour. Popcorn not included. The many faces of Korean Buddhism. All photos copyright Mark Schumacher. 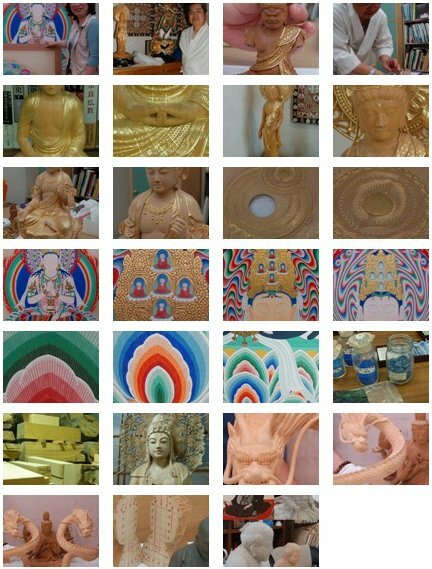 Asaba Buddhist Art Studio あさば仏教美術工房, located in Osaka’s Asahi ward, is a magical place with magical people. During a recent visit, I met the husband-wife team of Mukoyoshi Yūboku 向吉悠睦 and Nakamura Keiboku 中村佳睦, two of Japan’s most lauded contemporary artists of Buddhist statues, paintings, and crafts. 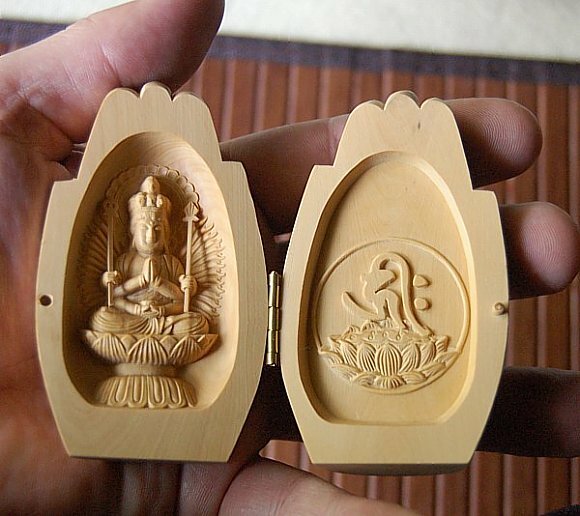 Mukoyoshi specializes in Buddhist sculpture while Nakamura specializes in butsuga 仏画 (iconic Buddhist paintings) and kirikane kōgei 截金工芸作品 (crafts using cut gold leaf). Mukoyoshi says: “We actually started out in opposite fields. She began as a sculptor. I began as a painter. But today she is the painter and I the sculptor.” They are extremely amiable people and their love of religious art is palpable. Half of their work involves the restoration of icons and paintings for renowned temples and other patrons, while the other half comes from new commissions. Both are acclaimed artisans at the height of their professions. The intricate gold-leaf patterns on Mukoyoshi’s statues (see slideshow below) are the handiwork of Nakamura and her team of assistants. Nakamura is likewise a virtuoso artisan of highly decorative and meticulously designed boxes and sutra containers. She has coauthored a number of books, including one with her husband entitled An Affectionate Introduction to Buddhist Statues やさしくわかる仏像入門. Click here to view a slideshow of their Buddhist artwork. Art from Mukoyoshi Yūboku 向吉悠睦 & Nakamura Keiboku 中村佳睦, two of Japan’s lauded contempoary artists of Buddhist statues, paintings, & crafts. We are working hard to source new “inexpensive” products at Buddhist-Artwork.com. The strong yen and weak dollar are impacting sales and a “global” price increase (in US$ terms) is imminent for our online Buddhist statues. To ride out the store, we are trying to source “all new” products — all selling at $100 or less. For example, the below Ebisu & Daikoku set and the Praying Hands Kannon will soon be made available (once online pricing is firmly established).